Joel, the owner of Baker Cleaning Service, recently made his transition to BsnTech Networks for website hosting services. Initially, they had a website but were not happy with it. After allowing some family members to try updating the site, Joel decided to have us professional re-design the site. We got started and worked with Joel over the course of two weeks to re-design the site and make it more attractive. We also added in new pages to help break out the services that they offer. Joel was very happy with the finished site and is pleased to show it off to his customers. We appreciate the continued business from Joel! 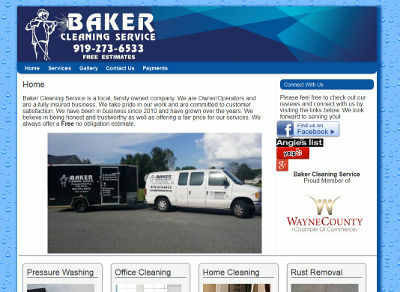 The Baker Cleaning Service website is at bakercleaningservice.com.